Shrimp Ceviche. Photo courtesy The Shrimp Council. No sugar, no salt, no added fat. Citrus juice is high in antioxidants plus vitamin C; and a good source of potassium and folate. Fish and seafood are high in protein. Ceviche is low in calories: Most fish have 30-40 calories per ounce; shrimp and lobster have 30 calories, bay scallops 25 calories and octopus 35 calories per ounce. Added ingredients such as chile, cucumber, herbs, onion and tomato add negligible calories. This dish can be made with scallops instead of shrimp, or a combination of the two. Recipe yields 2 servings. The recipe is courtesy Sea Port Products Corporation. *The marinade will cure the shrimp, so you don’t need to cook it fully. If using raw fish, cure for 2 hours. †Use Meyer lemon and Key lime for more flavor nuances. Cook and drain shrimp. Transfer to a bowl. Add lemon and lime juices. Stir in cucumber, red onion and chile. Refrigerate for 1 hour. Stir in tomato, avocado and chopped cilantro. Mix gently, taste and season with salt. Allow to sit for about 20 minutes for the flavors to blend. 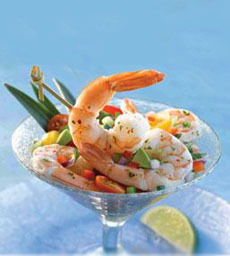 Spoon ceviche into martini glasses or small bowls. Garnish with sprigs of cilantro and slices of lime. Serve with tortilla chips or fried plantain strips. See more serving suggestions on the next page.